WASHINGTON, DC, UNITED STATES , January 27, 2019 /EINPresswire.com/ — Michael Marshall, President, and CEO of MMD-Michael Marshall Design and his sister, Vanessa Marshall Jones, ESL Instructor and Youth Advocate of Encourage Friends and "Stop Bullying in it's Tracks" Campaign, have launched an inspirational children’s picture book which teaches faith, friendship building, self- confidence, courage, and hope. This mystical tale gives children a playful, glimpse of Africa, its safari animals, and an inspirational storyline that will leave children of all ages wanting to read ATTIANA'S JOURNEY or have it read to them, again and again. For an added twist, vividly colored images of 3-D paper cut-out illustrations were created by, award-winning architect, Michael Marshall, whose work from a lifelong career in Architectural Design can be found on display at the Smithsonian’s NMAAHC. This book would be a favorite of children ranging from three years old to adults who enjoy unique art techniques. 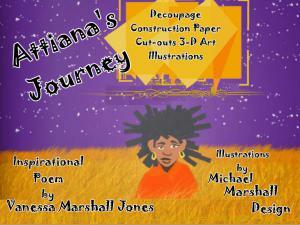 Jones, being a Literacy Volunteer and a member of the Friends of the Library Association, went with the decision to write Attiana’s Journey in lyrical verse, in hopes that young children would have fun with memorizing the poem and placing emphasis on word pronunciation and spelling. Jones begins the story at the bedtime of a young girl, Attiana, who tells the story of her journey to Africa, but is unsure if it is reality or a dream. She interacts with safari animals along the way, as well as the beautiful sun, which travels high above. When evening comes, the sunset queues the animals to retreat home. Attiana, then, feels lonely and afraid. She wants to return home, as well, but she is lost. Relying on her faith, she prays to God for guidance. He answers by taking her on a mystical escapade filled with adventure and excitement and a very unusual, or should I say unexpected outcome. www.encouragefriends.com/books. Hoping to inspire children to return to the day of the paper doll as an escape from a technology-filled toy world. The intent is to encourage the child's imagination to create self-colored designs, both clothing, and accessories, for the tall Attiana display standee doll. The templates will be provided via download and all that is needed is imagination and colored markers, glitter, rhinestones or other appropriate art materials. The book character’s pajamas were created white to leave the reader/artist the opportunity to utilize their own colors and creativity. The standee doll will also include an orange tissue paper-like scarf to represent the one the book character is wearing. Attiana's Journey, the Inspirational Stage Play, book animation, and "What is This Life About?" new music project are next. This Gospel / Positive Rap single, performed by Jones, the Encourage Friends Kidz Project, and Jones' son, Kenny Lee can be streamed and downloaded at http://www.encouragefriends.com. As our country faces such a divisive, scary time and a grim political climate, children are watching it all transpire and are questioning their future world. This has inspired Jones to write the song and start the "What is This Life About?" movement, which is slowly picking up momentum. Jones explains that this book project has been a long time coming. She felt very honored when her brother, Michael, called her up, one day, and said, "Hey, did you ever finish that poem about the little girl going to Africa? Send it to me. I have an idea for the illustrations and I will work on it in my free time." Jones says its an awesome feeling when someone reads your written words and gives visual life to them that perfectly matches your imagination." Attiana’s Journey is available for purchase at Barnesandnoble.com and Amazon.com For more info about the author, an Author's Visit or the Stop Bullying in it's Tracks Campaign, please visit www.encouragefriends.com/books or use contacts, below. Jones is seeking traditional publishing-Literary Agent- for future work.- Please visit our social media pages and hit LIKE to support and our website https://www.encouragefriends.com to donate to our kidz project!